We are very pleased to announce that the long-awaited book on the Piyutim of the special shabossos and Purim, according to our minhag Is available for sale. The seifer was written by our member, Rabbi Moshe Rosenwasser, and was received enthusiastically by leading Rabbonim in Eretz Yisrael, the USA and Europe. It is available for a subsidized price of 25 NIS in Israel and $10 in the USA. For more data see attachment. Mazal Tov to R' and Mrs. Yeshayahu Schneller, on the birth of 2 granddaughters. Mazal Tov to R' and Mrs. Reuven Schneller, on the birth of their daughter. Mazal Tov to R' and Mrs. Avraham Roz, on the birth of their daughter. Mazal Tov to R' and Mrs. Eliyahu Lewin on the wedding of their son. Mazal Tov to R' and Mrs. Chayim Ochs on the wedding of their daughter. To conclude the wonderful and uplifting days of the Yomim Touvim, with wonderful shiurim and special Tefillos, please see beneath a summary of the shiurim we had (on שבת and יום טוב). We will be happy to send the full shiurim (in Hebrew) by request, via email. On the first night of פסח, Moreinu Harav Yisroel Gans (our Rov's father) spoke about the two מצוות in Leil Haseider - to show to others that we came out of Eygpt (להראות עצמו כאילו יצא ממצרים) and to see oneself as if he came out of Eygpt (לראות עצמו כאילו יצא ממצרים). the first Mitzvoh is until חצות, and the second is until the morning. On the last night of פסח, Rav Shlomo Fischer spoke about the two different types of Hallel - 1) Hallel as a song, said on the Seider night 2) chanting the Hallel as done usually, standing up, without stops etc. He pointed out that the difference is dependent on one's purpose. If one aims to thank as a son to his father, he then sings out the Hallel without any borders. If the tenor is as a slave to his master, then he chants the Hallel in its fixed text. He explained why we don't say Hallel on the 7th day of פסח, (only a partial Hallel, which is a Minhag) and why the laining continues until "כי אני ה' רופאך". On Friday night, our Rov, Moreinu Harav Yehudoh Gans shlit'o, spoke about eating Chomeitz or קטניות on Shabbos in Eretz Yisroel. The Rov discussed if there is a problem of Muktzeh since one couldn't eat it at בין השמשות, when Shabbos entered. He cited the different sources to this discussion and the halachic conclusion. Mazal Tov to R' and Mrs. Michoel Kernberg, on the birth of their granddaughter. After a long time of getting arranged, a new Minhag Ashkenaz minyan has begun in Sanhedria Murchevet. Last week, Parshas Vayikro (החודש) was the first time the minyan got together. Approx. 45 adults and boys came for the Friday night Davening. Between קבלת שבת and ערבית R' Moshe Hamburger spoke, about the importance of continuing the מסורת אשכנז. A new Minhag Ashkenaz minyan has begun for the month of Nisson! Visitors and Residents of Ramat Eshkol, Sanhedria, Sanhedria Murchevet, Maalot Dafna, Arzei Habira, and Givat Moshe and beyond are invited. The minyan is located in Rabbi Stefansky's yeshiva in the Beis Hatalmud building in Sanhedria Murchevet (once inside the building, turn left and go up the stairs). Davening for now is only on Friday nights. The location is temporary and has only been given for the month of Nisson. If anyone knows a location that can be used after Nisson, please contact us. We will be very happy to welcome visitors on Pesach – please join us for Davening on יום טוב or חול המועד. Shacharis on חול המועד is at 7:50 AM, Mincho is at 6:45 PM, followed by a shiur, and Ma'ariv. Mazal Tov to Moreinu Harav and Rebetzin Gans on the wedding of their son Boruch. Mazal Tov to Moreinu Rav Don Ison and his wife on the wedding of their son Yissochor. Mazal Tov to R' and Mrs. Meir Erlanger on the engagement of their son Uri. Mazal Tov to R' and Mrs. Eliyahu Levin on the wedding of their daughter. Mazal Tov to R' and Mrs. Yitzchok Sinason on the wedding of their daughter. We are very happy to inform our friends and supporters, that we have finished building the structure for the first stage of the KAYJ בית אשכנז (see picture attached). You can see the building progress, and the artist rendering of the completed shul at the "building" section of the site. We would like to thank everyone who donated towards the first stage of the building, and we are looking forward to continue with the second stage as soon as funding is available. All donations to KAYJ are tax deductible in the USA and in Israel, and can be done via the site (http://www.kayj.net/contributions) or by check. On שבת שופטים, Rav Hamburger came to KAYJ, to celebrate the bar mitzvah of Dan Friedman, son of R' and Mrs. Michael Friedman. The choir sung at night and in the morning, the bar mitzvah boy read the פרשה, and his 9 year old brother read the הפטרה. We have just seen the beginning of the building of the beautiful shul which will be standing in the heights of Jerusalem. This shul was very important for the bar mitzvah boy's great-grandfather, Prof. Friedman, and there is no question that if he would be here with us, and hear the way his great-grandson, Dan, read the פרשה, and the way his little brother, Elazar, read the הפטרה, he would be full of happiness and pride. Who would believe, that within the holy city of Jerusalem, the old Jewish-German traditions and melodies would be revived! It is no secret, that the deep love R' Michael Friedman has to the Ashkenaz melodies, came from his grandfather, Prof. Friedman. Prof. Friedman cared so much about the shul and was excited that his grandson was building a shul in his family's tradition. 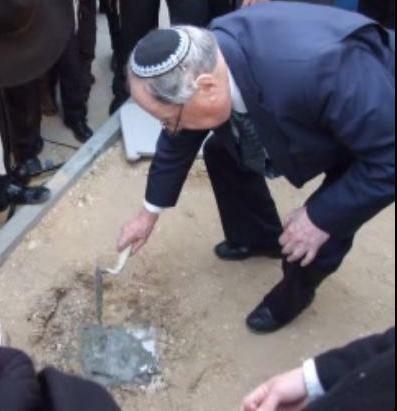 I cannot forget the happiness he had when he bent down to cast the foundations! (see picture below). The shul is located in one of the highest places in Jerusalem, and will be seen from far away. We all hope to see the shul built in the close future, בורא עולם בקנין השלם זה הבנין. We will be very happy to welcome visitors to Jerusalem today צום גדליה– please join us for the Davening. מנחה is at 5:45 and מעריב is at 6:52. (מוצאי צום in Jerusalem is at 6:55). Mazal Tov to R' and Mrs. Eliyahu Lewin on the wedding of their daughter. Mazal Tov to R' and Mrs. Michael Friedman on the bar mitzvah of their son. Mazal Tov to R' and Mrs. Shmuel Kaplan on the birth of their granddaughter.